It's a fair few years now since Canon launched its ground-breaking five-ink printing system, featuring dye-based cyan, magenta, yellow and black inks, as well as a secondary pigment-based black ink in the line-up. The idea behind the so-called ContrastPlus configuration is that the pigment-based black ink gives strong black text, rather than the faint grey appearance often associated with dye-based black ink, while contrast is boosted for accurate colour photo reproduction. Based on the latest ChromaLife100+ incarnation of the system, the MP640 takes the tried and trusted print engine from the super-fast PIXMA iP4700 bare-bones printer and adds a veritable wish-list of all-in-one extras, from standalone photocopying to photo printing direct from memory cards. Playing the numbers game to great effect, the MP640 boasts class-leading print and scanning resolutions of 9600 x 2400dpi and 4800 x 9600dpi respectively. While the HP Photosmart Premium C309G matches the Canon's print resolution, the MP640 reigns supreme in this price bracket when it comes to scanning. 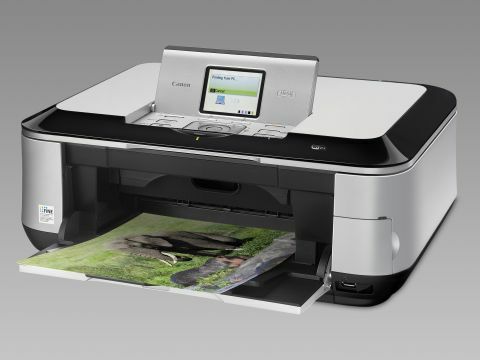 Colour rendition, contrast and brightness are unerringly accurate, Canon being somewhat of a pioneer when it comes to CIS (Contact Image Sensor) scanning, as used in most all-in-one printers and featured in the company's top-performing standalone flatbed scanners like the LiDE 100 and LiDE 200 models. A wide range of connectivity options includes USB 2.0, Ethernet and Wi-Fi, and there's also an optional Bluetooth adaptor for printing from mobile phones. Unlike the Lexmark Interact S605, the MP640 doesn't have a touchscreen but relies on a more conventional, yet generously proportioned, 7.5cm colour LCD, along with control buttons and a handy 'easy-scroll' wheel for standalone operation. In practice, this is every bit as intuitive and quick to operate as a touchscreen, in line with the high levels of performance and convenience of the printer itself. In normal-quality print mode, the MP640 outputs single page mono and colour A4 documents in just seven seconds and 16 seconds respectively. In fact it's so fast that we found ourselves adjusting the default printer driver setting to lengthen the gap between subsequent pages for multi-page document printing. This gives the ink a chance to dry sufficiently and avoid smudging when the next page hits the output tray. Switching to photo printing, speeds are similarly brisk at just 19 seconds for a 6 x 4 photo in normal-quality photo mode and fractionally under two minutes for a borderless A4 photo in top-quality mode. What's even more impressive is that, despite not featuring a traditional six-ink colour system, as used in most dedicated 'photo' inkjets, the MP640 produced more stunningly glorious and realistic photo output than any other A4 printer we've tested. Other luxuries include dual input trays for loading plain and photo paper, both of which can handle sizes up to A4, auto duplex printing and direct printing onto compatible CDs and DVDs. All in all, the MP640 is a wonderfully versatile piece of kit.